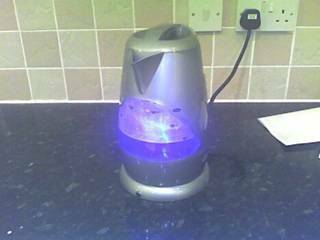 I forgot to mention that behind the muffin toast bag is our lovely and shiny new toaster which matches our fancy kettle. I really must find something new to blog about than kitchen implements and shopping. Yesterday, John kindly offered to make dinner, but in return I had to go to Somerfield to buy some ingredients. All was fine until I bumped into neighbour Stefan on the street, also going to Somerfield. And so it was that I went to the shop to buy milk, tomatoes, stock cubes and garlic, and left with white smarties, muffin toast (pictured below) and other random junk. I blame Steve for this as he scared me and made me forget what I was supposed to buy. 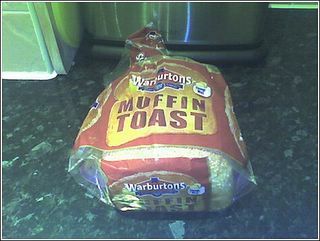 The muffin toast is Warburtons (obviously) and I have not tried it yet, but do not fear, I will let you know just as soon as I do. On Saturday night (or was it Sunday morning?) I vaguely remember having a conversation with Paul about toast. Apparently, Emma used to eat toast upside down, with the butter or other topping at the bottom, and said it tasted better. This sounded like utter nonsense to everyone present. After buying a new toaster on Sunday (to match our fancy new illuminating kettle), I decided to test out this theory. I made my toast, put Tesco brand fake Olivio on it and ate it upside down. Findings: The toast surprisingly did taste better eaten this way. Not only was there more fake Olivio getting to my tongue, but the side of the toast on my tongue was softer and not as rough. Who would have thought it? I recommend you all try it at breakfast tomorrow. I'm not entirely sure why the kettle was in the bathroom, but whatever the reason was, it ended in disaster as the kettle fell on the floor and broke. Poor kettle. However, every cloud has a silver lining, and it did mean that we could go and buy ourselves a shiny new kettle. Last night we marked the month of birthdays with a joint celebration in Birmingham. Since Gav and myself had already had our own celebrations, it was mainly Gary's night out really. We started off in Santa Fe restaurant and cocktail bar, where we had nice food and cocktails - margharita and two mojitos (one classic on chocolate) for me. Mmmmmmmmm.... Phoenix and Pete caught up with us here and gave me a fab gift of a coffin 'Nightmare before Chrismas bag'. Cool and very useful for the evening. After cocktails we moseyed on to some pub which name I forget, where Gary pulled some bloke whose name was Dave and who was gay. I know this because he came up to Gary and said "Hello, my name is Dave and I am gay". That was funny, but for some reason not as funny as a story about someone called Gary Greenwell, which made me cry with laughter. I'm not sure why since it wasn't really his name and wasn't that funny anyway. After pub closing, we headed for the main event - Edwards! After a slight queue we set about buying drinks and exploring. The beer was extremely cheap, which is always a bonus, and the place was full of bizarrely dressed freaks (always a bonus too). We did a fair amount of dancing and a bit of drinking, and some of us made new friends (Tracy?) All in all, much fun was had by all. After building up an appetite from flailing around, we headed to Shahs, where we had tasty food and Paul continued his tradition of breaking glasses after drinking mojitos by smashing a wine glass, and I also spoke to Mandy on the phone for a while. Shah's called us a taxi at 3.30am, and I thanked them by stealing a nice Cobra glass from the table. We never actually slept in Colorado or Utah, but we saw lots of Utah (and drove the width of it) and we will probably never go back to Colorado, so I am including them. Its my project and my rules, OK? We may also not sleep in Conneticut or Rhode Island. Annoyingly, we drove within about five miles of Arkansas, but forgot to go. I know I haven't blogged for a while, but don't you worry, I am still around. I have been a little busy recently, with John's parents visiting for Christmas, nipping up north to see my family after Christmas, getting a new car, having a New Years fancy dress party, and just general festivities. I have also been doing lots of marking work for Edexcel, in order to pay for our planned summer trip to the states. We booked our flights on Thursday and we are very excited. We will be flying into Boston, staying in a fancy hotel for three nights, and then we have twenty five days to follow the Oregon trail before flying back from Seattle. It is also the season of the birthday - we went out to Moo and Sugar for Gav's birthday yesterday, its my birthday on Tuesday, we are off to Birmingham next weekend for birthday extravaganza cocktails and rock (rocktails) next Saturday, and its Gary's birthday on Sunday. I am tired. Will this gallivanting never end?